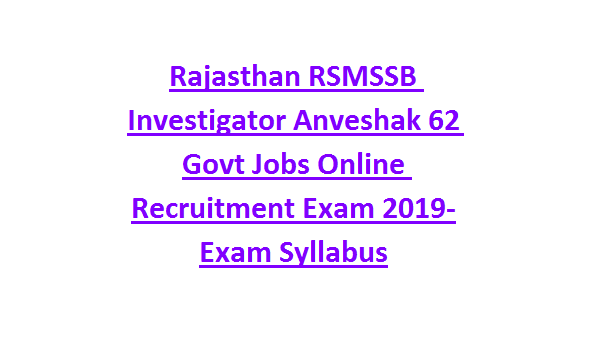 RSMSSB Investigator Anveshak Recruitment Exam Syllabus-2019: Rajasthan RSMSSB invites applications from the eligible candidates for filling the Investigator/Anveshak jobs in Agriculture Department of Rajasthan. 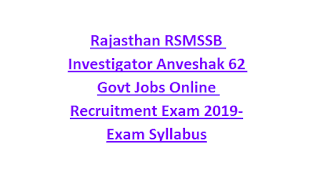 There are total 62 Investigator jobs in this RSMSSB Recruitment 2019. Candidates who qualified Degree with Maths and statistics or Degree with Agriculture and Statistics they are only eligible to apply online for this RSMSSB Investigator jobs. Candidates can apply online for this RSMSSB Investigator posts from 23-01-2019 to 24-02-2019. Official website for this RSMSSB Anveshak Posts is www.rsmssb.rajasthan.gov.in. Here we are also updated the Exam Syllabus for RSMSSB Investigator posts. RSMSSB Investigator Exam Pattern and Syllabus PDF, age limits, qualifications, selection process and more details are updated below. There are total 62 posts in this RSMSSB Anveshak jobs bharti. As on 01-01-2020 age limits are 18-40 years for general candidates and for reserved category persons age limits are applicable as per the Rajasthan State Govt Norms. Degree in Maths and Statistics or Degree in Agriculture & Maths qualification required to apply online. Level 10 salary is applicable for this Rajasthan Anveshak Posts. Written Exam will be conducted for the RSMSSB Investigator posts. Apply online for this Rajasthan RSMSSB Vacancies of Anveshak before the closing date of 24-02-2019. Official website is www.rsmssb.rajasthan.gov.in. Anveshak Exam Pattern and syllabus, anveshak exam admit card and other details will be updated in this website only.